Wayne W. Dyer is an internationally renowned author and speaker in the field of self-development. He has written numerous bestselling books, including Your Sacred Self, The Power of Intention and Wishes Fulfulled. One of the most widely read authors today in the field of self-development, he has also created many audio and video programs. A psychotherapist, Dyer received his doctorate in counseling psychology from Wayne State University and the University of Michigan, and has taught at many levels of education from high school through graduate study. He is the co-author of three textbooks, contributes to numerous professional journals and lectures extensively in the United States as well as abroad. 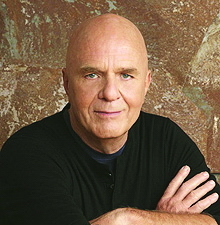 Please visit his website at www.drwaynedyer.com. Bestselling author and lecturer Wayne W. Dyer has created this DVD, based on his thought-provoking book, for those of us who have chosen to consciously be on our life path. On this powerful and inspirational "audio," Dr. Dyer offers you 101 ways to make your life more fulfilling and enjoyable. You’ll love listening to Dr. Dyer’s transformational thoughts at "home," in your "office," and in your car! From the author of Your Erroneous "Zones," most recently "Inspiration," and many more between. Part of a successful series of page-a-day calendars, this 2020 calendar offers a collection of inspirational quotes drawn from the decades-long career of beloved spiritual teacher and #1 New York Times best-selling author Wayne Dyer.